Why See Bela Fleck And The Flecktones? Groundbreaking banjoist/composer/bandleader Bela Fleck reconvenes with the original Bela Fleck & The Flecktones, the extraordinary initial line-up of his incredible combo. While all manners of genres come into play - from classical and jazz to bluegrass and African music to electric blues and Eastern European folk dances - the result is always an unforgettable performance. Bela et al will be reuniting for a very special two-week only tour this summer, hitting Revolution Concert House and Event Center in Garden City , ID , June 2, 2019 . In 2012, the band announced an indefinate touring and recording hiatus in order to pursue other projects, or to spend time with their respective families; not entirely surprising as the collective have been known to tour over 200 engagements a year! So before they disappear yet again, make sure you're in line for one of the most anticipated reunions in the bluegrass scene. Sound good to you? Share this page on social media and let your friends know about Bela Fleck And The Flecktones at Revolution Concert House and Event Center. Please note: The term Revolution Concert House and Event Center and/or Bela Fleck And The Flecktones as well as all associated graphics, logos, and/or other trademarks, tradenames or copyrights are the property of the Revolution Concert House and Event Center and/or Bela Fleck And The Flecktones and are used herein for factual descriptive purposes only. 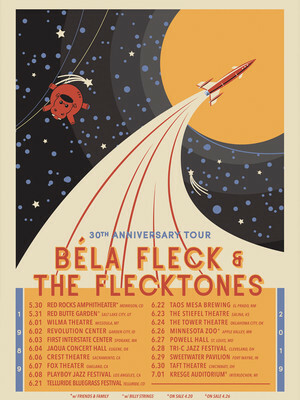 We are in no way associated with or authorized by the Revolution Concert House and Event Center and/or Bela Fleck And The Flecktones and neither that entity nor any of its affiliates have licensed or endorsed us to sell tickets, goods and or services in conjunction with their events.